(Nanowerk News) Thirty years ago, the future lay in programming computers. Today, it’s programming cells. That was the message of panelists at an afternoon session yesterday (March 25) in Stanley Hall auditorium titled “Programming Life: the revolutionary potential of synthetic biology.” Co-presented by UC Berkeley’s Synthetic Biology Engineering Research Center (SynBERC) and Discover magazine, the panels brought together a dozen of synthetic biology’s pioneers from academia and industry, in addition to ethicists focused on the societal impact of the technology. Keynote speaker Juan Enriquez, a self-described “curiosity expert” and co-founder of the company Synthetic Genomics, compared the digital revolution spawned by thinking of information as a string of ones and zeros to the coming synthetic biology revolution, premised on thinking about life as a mix of interchangeable parts – genes and gene networks – that can be learned and manipulated like any language. Ursin, Keasling and Steve Evans of Dow AgroSciences discuss the economic potential of synthetic biology with Discover magazine’s Corey Powell. At the moment, this genetic manipulation, a natural outgrowth of genetic engineering, focuses on altering bacteria and yeast to produce products they wouldn’t normally make, such as fuels or drugs. “To do with biology what you would do if you were designing a piece of software,” according to moderator Corey Powell, editor at large of Discover, which plans to publish a story about the conference and post the video online. Keasling, director of SynBERC, a UC Berkeley-led multi-institution collaboration that is laying the foundations for the field, expressed excitement about the newest development: the release next month by the pharmaceutical company sanofi aventis of a synthetic version of artemsinin, “the world’s best antimalarial drug,” he said. Sparked by discoveries in Keasling’s lab more than a decade ago, the drug is produced by engineered yeast and will be the first product from synthetic biology to reach the market. But other advances are on the horizon, he said, such as engineering new materials and engineering “green” replacements for all the products now made from petroleum. “Some of these have the potential to significantly reduce our carbon footprint, by say, 80 percent,” he said. Panel discussion. 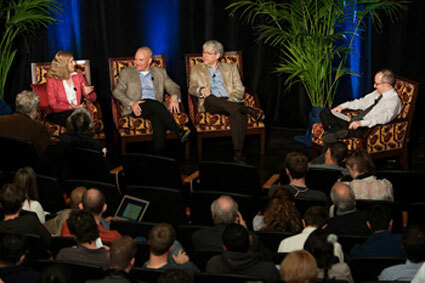 Virginia Ursin, Technology Prospecting Lead and Science Fellow at Monsanto Corp., noted that industry sees synthetic biology’s triumphs as being 10-20 years down the road, but anticipated, for example, producing enzymes used in manufacturing or even engineering microbes that live on plants to improve plant growth. “Engineering (microbes) to increase their impact on (plant) health or protection against disease is probably going to be one of the nearer term impacts of synthetic biology on agriculture,” she said. Ultimately, she said, the field could have a revolutionary impact on agriculture similar to the green revolution sparked by the development of chemical fertilizers. But the implications of being able to engineer cells go deeper, according to Enriquez. Directly guiding “the evolution of microbes, bacteria, plants, animals and even ourselves,” as Enriquez put it, sounds like science fiction. George Church, a biologist at Harvard Medical School, suggested that we might want to bring back extinct animals, such as the mammoth to help restore Arctic permafrost disintegrating under the impact of global warming. In response, ethicist Laurie Zoloth of Northwestern University urged caution in exploiting the technology of synthetic biology.